The shotgun microphone is a staple in the video production world. Highly useful for recording dialog, typically employed on a boom pole, the shotgun is a must-have in any video producer’s toolkit. At least it should be. With the rise of low-cost camcorders a few years back, and DSLRs today, more and more people are producing video. That’s not necessarily bad. However, too often, they forget (or don’t know anything) about audio and simply using the built-in mic on the camera. Before we go any further, if you’re shooting video and using the built-in mic, just stop it. Right now. Unless you’re shooting party footage, strictly B-roll, or your kids soccer game, do us all a favor and get a good mic. Like this one. Everyone shooting video should have at least one shotgun mic. Sennheiser recently (at NAMM, I think…) released a new shotgun mic designed specifically for video recording, the MKE 600. Sennheiser has a pretty good reputation in the shotgun mic space, so I was curious to see what set this apart. In external appearance and construction, it’s pretty ordinary. It’s basically an aluminum tube with slots all along the front, and an XLR at the rear. They thoughtfully included a low-cut switch, which rolls off frequencies below 100 Hz (at an unspecified rate), as well as a AA battery power option. According to the marketing material, the MKE600 is for “Video Journalists.” The included shock mount is designed to fit in a cold shoe, and supports the mic on a rubber cradle, isolated from camera noise. I’m normally not a fan of on-camera mic's (they’re typically too far away for good audio), but the mount is pretty clever. And I suppose if one was shooting with a wide-angle lens on a DSLR, you could get close enough to the talent for good audio. So how does the MKE600 sound? Actually, it sounds really good. I did a few tests with it. First, I gave it to my bud and monster bass player Norm Stockton to record some of his instructional sessions with. He had been using another shotgun mic for many of his other recordings, and found the 600 to be much warmer. The problem with many shotgun mic's is that they tend to get rather thin-sounding as you move away from them. Even at reasonable distances of 2-3 feet, you’re way out of the proximity effect zone, and that can make your vocals sound a bit thin. 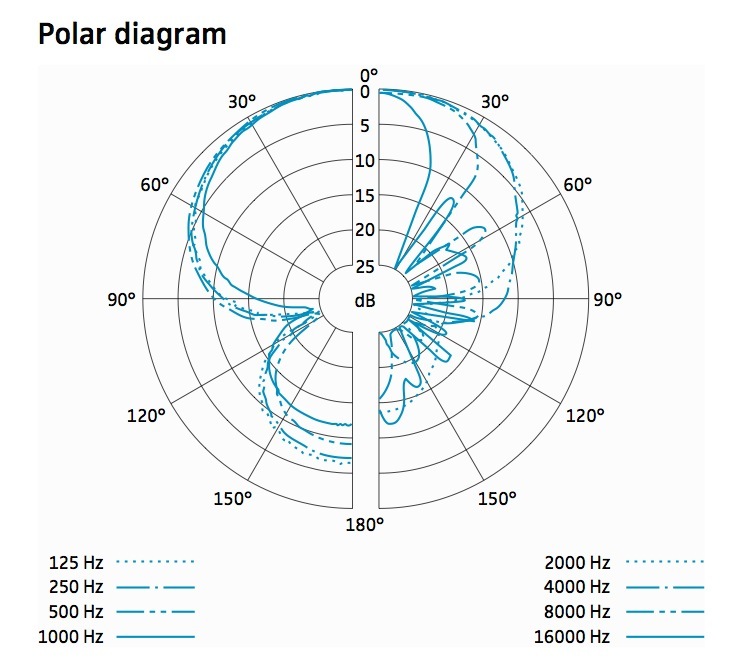 While the polar pattern is not bad at lower frequencies, you see a lot of lobing above 1KHz. Thus, it's not going to have great off-axis sound, or phase response. But that's not terrible, you want to be as close to on-axis as possible with a shotgun. 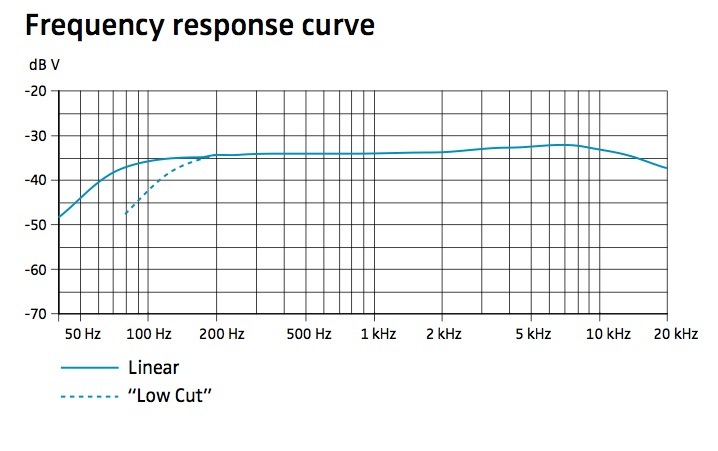 The MKE600 did a good job of keeping frequency response reasonably flat at good distances. If you get right up on it, the mic gets muddy, but I would expect that; it’s not designed to be a 2-3 inch mic. I compared it to my studio Heil PR-40, and while I sounded much richer and warmer on the Heil, I sounded much more natural on the MKE600 (which is why I use the Heil for CTW…). While not in the same league as a Schoeps, it also costs a fraction of, say a CMIT5U. At $399, the MKE600 is a pretty solid value proposition. I used to have an AT 8035 which I quite liked, and while this is a bit more pricey, it’s also more compact and has a warmer quality to it that would be nice on interviews and dialog. The foam windscreen is also quite a bit thicker than what you get with a lot of shotguns, and I suspect far more useful. Overall, it’s a good mic. It’s solidly built, reasonably priced, sounds good and comes with a 2-year warranty. Learn more at the Sennheiser website.